WEST, Texas — The search and rescue effort continues after a devastating and deadly explosion at the West Fertilizer Co. rocked the Central Texas town of West on Wednesday evening. "I ask for your prayers," said Mayor Tommy Muska. "Search and rescue teams have been working through the night." The number of those trapped inside rubble from the explosion is still unknown, said Sgt. William Patrick Swanton in a briefing just after 8 a.m. There were no precise numbers available of the dead and injured. "There is a significant area around the fertilizer plant that has been destroyed," Swanton said. "Homes have been destroyed; homes have been flattened; part of that community is gone." In an earlier news conference, the sergeant estimated the number of casualties from five to 15. The sergeant reported that one of the missing firefighters, who also serves as a law enforcement officer, was found in a hospital with serious injuries. Swanton said there are still an unknown number of firefighters missing. The volunteer firefigthers were reported missing after responding to the fire reported at the plant before the explosion. Swanton also said authorities have received reports of looting in the area. The sergeant said authorities were working to curb the problem by ensuring that only authorized people were allowed inside the neighborhoods. At 4:15 a.m., West, Texas EMS director Dr. George Smith confirmed that two paramedics lost their lives in Tuesday night's explosion at West Fertilizer Company. A Facebook page was established in memory of several firefighters who reportedly perished in the blast. The blast happened around 8 p.m. at the West Fertilizer plant at 1471 Jerry Mashek Drive, about a half-mile east of Interstate 35. Shortly before 10 p.m., a dispatcher was advising emergency crews to move away from the burning plant due to concern about chemicals in unexploded tanks. A few minutes later, WFAA's Todd Unger reported hearing more explosions north of the plant. "This is a crime scene," Sgt. Swanton said. "Until we know that it is an industrial accident, we will work it as a crime scene." He said the Bureau of Alcohol, Tobacco and Firearms is at the scene to conduct that part of the investigation. Swanton added that teams continued going door-to-door Wednesday morning looking for anyone who might be injured or trapped. The initial fire call at the fertilizer plant was logged at 7:29 p.m. Twenty-four minutes later -- as firefighters, police and paramedics were evacuating nearby residents -- there was a devastating explosion. At the 8 a.m. briefing, Swanton said the fires at the plant and homes continued to smolder but were not out of control. The explosion was so large the U.S. Geological Survey classified it as a 2.1 magnitude earthquake. According to records from the Texas Commission on Environmental Quality, the plant worked with anhydrous ammonia, a colorless gas. While the facility is known as a plant to those who live in the area it's actually a fertilizer chemical storage facility. No fertilizer is actually made at the site. Texas Department of Public Safety spokesman D.L. Wilson said half the town was evacuated –– if the wind shifts to the north, Wilson feared the other half would need to leave as well. "There still are other ingredients there on the facility so we don't want that to explode again," the trooper said. "We're worried about people, not property." Hillcrest Baptist Hospital in Waco treated about 94 patients, said spokesman Glenn Robinson. He estimated about 12 to be critically wounded and the others to have more minor injuries, such as lacerations. He said many patients had already been discharged by 1 a.m. and expected the majority to be allowed to leave by the morning. Some individuals were still being transported in school buses early Thursday morning. "That's an encouraging number because that means we've been able to treat and release a great number that we've already seen this evening," Robinson said. While the outpouring of support from emergency officials was encouraging, Wilson said enough are in the town. "We are overflowing with help," he said. "We do not need any more help." Mayor Tommy Muska said 133 people at a nearby nursing home all had to be evacuated. A hotline has been set up for an people looking for loved ones possibly injured in the explosion. Here is the number: (254)202-1100. The video above is from a witness who caught the explosion on camera. Dozens may be dead following a massive explosion at a fertilizer plant in West, TX following a Wednesday evening blast . The explosion happened around 8:00pm at West Fertilizer, Inc. A triage was initially set up at a nearby high school football field, but they were later moved from the football field to a location six blocks away for fear of a second explosion. The City of West has been evacuated, and West ISD has informed us via twitter that the schools will be closed until further notice. A witness caught the explosion on camera (see above). A raging fire turned into a massive explosion at a fertilizer plant in West, Texas on Wednesday night. Initial reports are that there are at least 160 people wounded and an estimated five to 15 dead. The immediate neihborhood around the site of the explosion has been evacuated and rescuers are sweeping through the area, house to house, looking for people. Follow below for the latest updates. A major explosion occurred Wednesday night at a fertilizer plant in the city of West, near Hillsboro in north-central Texas - killing between five and 15 people and injuring at least 160 more. Three to four firefighters who were battling the fire that occurred before the explosion are unaccounted for. Waco Police Spokesperson Sgt. William Patrick Swanton said a fire began Wednesday evening at the West Fertilizer plant. Fifty minutes later, an explosion was reported in a frantic radio call from the scene of the fire at the plant at 1471 Jerry Mashek Dr. just off Interstate 35. Authorities said there is no indication that the blast was anything but an accident. EMT's in the area said they saw broken glass everywhere, homes were on fire and the mood was chaotic. Swanton said as of 8:30 a.m., search teams are still searching for people. He said many people were still trapped inside homes and businesses near the explosion. He said while driving through the debris, he saw windows blown out, bricks torn off buildings, and homes were leveled. He compared the scene as "tornadic in effect"and said "part of the communality is gone." There are also reports of people looting some of the empty homes that were evacuated right after the blast. The mayor of West held a press conference at 5:30 a.m. "I ask for your prayers," Mayor Tommy Mouska said. There are reports of injuries and widespread building damage. Sky4 showed an apartment complex blown apart by the blast. According to Fox 4's Dan Godwin, five to six blocks are leveled and 50 to 60 homes are damaged. Early morning rain helped put out hotspots but hindered rescue efforts. Sky4 also showed fires still raging at part of the plant more than two hours after the initial explosion. At 12 a.m., D.L. Wilson with Texas Department of Public Safety said gas companies are turning off gas to the areas where the explosion happened. He said with all the firefighters and EMS flowing into the town, no more help is needed at this time. "First of all our hearts and prayers go out to the community out here in West. It's a small farming community, with a Czech background," said Wilson. "They've always opened their arms to everybody that passes through here on I-35 and McLennan County, Texas. Our hearts and prayers go out to them. This is an unbelievable tragedy that's happened here tonight." At 11 p.m., Mayor Tommy Muska said the fires in town are under control. He said buildings within a five block radius were heavily damaged. Muska said that 133 people at a nearby nursing home all had to be evacuated. He said there is no official casualty count yet. DPS Spokesman D.L. Wilson said Mayor Muska will speak again Thursday. He said there are confirmed fatalities, and a tremendous amount of people with injuries. Many of the injuries at the nursing home were from shards of glass. At least nine people with bad burn injuries were taken to Parkland hospital in Dallas. Officials said immediate family members only can call 254-202-1100 looking for loved ones. Crews from multiple fire and rescue departments are at the scene. According to FOX 4's Brandon Todd, as many as 30 people were taken away from scene in wheelchairs -- many of them injured at a nearby nursing home. A medical response/triage center was initially set up on the football field in West. In fear of a second blast, the triage center moved to a community center around 10:30 p.m.
Oncor's reported more than 1,100 people were without power in the area. People felt the explosion as far as Red Oak, Ennis, Cleburne, Hillsboro and Waxahachie. West ISD says all campuses are closed Thursday and Friday. Further announcements will be made this weekend. A DPS spokesperson says 75 to 100 homes and businesses have been destroyed. The FAA has placed temporary flight restrictions over the scene. Only emergency aircraft are allowed in the restricted 3 miles radius. Red Cross is sending teams from Dallas/Fort Worth and Austin with supplies. n relation to the popular Czech Stop Grocery & Deli shop where many folks stop to get kolaches and other snacks, the West Fertilizer is five minutes away. Many hospitals near West will need blood donations. To donate, contact Carter BloodCare at their website and find a location nearest you. If you live in East Texas you are being asked to go to the nearest Carter Bloodcare to donate. They are just now showing some pictures this morning. Unbelievable the destruction. Most critical patients to Hillcrest Baptist in Waco, followed by Providence Hospital. RT @jayhicks: Trooper Wilson: Plant is still smoldering. Won't go back in. 50-75 homes have been destroyed. The West Police Department has called for a mass evacuation. West ISD says all campuses are closed on Thursday and Friday. Watch for further news announcements over the weekend. USGS reports the explosion in West had a magnitude of 2.1 on the Richter scale. Family members worried about loved ones can call (254) 202-1100 at Hillcrest. Call (888) 394-4947 for information on family members at Scott & White. Valley Mills Nursing Home has rooms available for nursing home residents if placement is needed for any of the West Nursing home residents. Call (254) 932-6288. Nativity of the Blessed Virgin Mary Parish at 219 W. Magnolia Street, Penelope, TX 76676 can handle 100 families. Evacuees were told to go to the Community Center in Abbott, Texas, about five miles north of West, Texas. All Gholson ISD schools have been opened to be used as shelters. Penelope High School has been opened for survivors. Carter Blood Center in Waco will be taking blood donations at 9 a.m. Thursday morning. Scott and White Blood and Donation Center taking blood donations overnight. Both Peas & tots and Smarty Pants consignment stores in Waco are accepting clothing donations in all sizes for those in West. Axtell High School will be taking any kind of donations at the school on Thursday. Please donate anything. the PALS organization is taking all donations and will be accepting tomorrow and Friday during school. 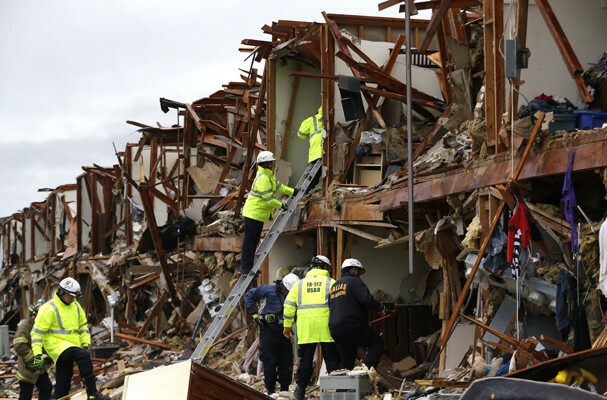 WEST, Texas—Rescue workers on Thursday began scouring the blast zone of a massive fertilizer-plant explosion that has left up to 15 people dead or missing, including emergency workers who responded to the initial fire, officials said. Law-enforcement officials said the death toll could rise, even as they looked for people still trapped in debris. As a heavy rain fell in this small town north of Waco, fire crews combed through the adjacent neighborhood. "We're still searching for survivors," Waco Police Sgt. William Patrick Swanton said Thursday morning. The facility stored and blended anhydrous ammonia that it distributed as fertilizer to local businesses, according to a 2011 safety plan filed with the federal government in 2011. According to this plan, it didn't have an automatic shutoff system or firewalls installed. It was located across the street from a park and within 1,000 feet of a school, homes and an apartment complex, where many of the injuries occurred. More than 150 people have been treated for injuries relating to the fire and explosion, according to local hospitals. There is an assisted-living facility close by, but more than 130 people had been evacuated from it after the fire broke out but before the explosion, said Texas state police. Gov, Rick Perry will be holding a news conference at the Austin Department of Public Safety to update on federal help at 11:45 am. Mr. Swanton said the death toll is only an estimate as search-and-rescue operations remain under way in the town of West. The whereabouts of several volunteer firefighters remain unknown. He described a scene of "extreme devastation" near the site of the explosion and added that he expected there would be a rising list of fatalities. Mr. Swanton said there is no indication the blast was anything other than an industrial accident. The federal Bureau of Alcohol, Tobacco, Firearms and Explosives has activated a team to go to the site to determine if the cause of the fire and explosion at the fertilizer plant was "accidental or criminal," spokesman George Semonick said. The U.S. Chemical Safety Board said that it was deploying a "large investigation team" to the scene of the fire and explosion. State officials have set up air monitoring nearby. A spokesman for the Texas Department of Public Safety, D.L. Wilson, said the blast heavily damaged 50 to 75 homes, as well as an apartment building with roughly 50 units near the site. An explosion at a fertilizer plant Wednesday night in the town of West killed an estimated five to 15 people, injured more than 150 and damaged dozens of homes, officials said. Overnight, hundreds of emergency responders descended on West — a town of about 2,800 located 20 miles north of Waco — where scores of people were sent to area hospitals and dozens of homes, apartments and a nursing home were toppled or damaged, officials said. Gov. Rick Perry said he has declared a state of emergency in McLennan County and said President Barack Obama, in a phone conversation Thursday morning, promised a quick turnaround on the state’s request. 11:45 update: At least four volunteer firefighters are thought to be among the fatalities, but that has not been confirmed, said Chris Barron, executive director of State Firemen’s and Fire Marshals’ Association. West has an all-volunteer fire department with 29 members, five of whom have advanced firefighter certification, he said. “It’s a very respected department,” Barron said. Barron said that normally when fire breaks out at an industrial facility with high explosive potential, firefighters rely on the plant manager to give direction as to whether firefighters should attempt to extinguish the flames or pull back and let it burn. He did not know what the situation was in West last night. 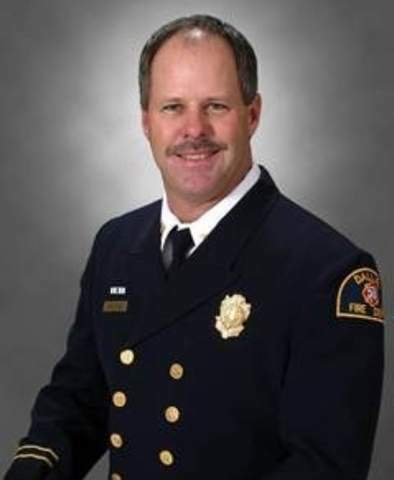 WEST, Texas — A Dallas Fire-Rescue captain was confirmed dead in the West Fertilizer Co. explosion, read a statement released by Lt. Joel Lavender, a spokesman with the department Thursday afternoon. Capt. Kenny Harris, who lives in West, served as a firefighter at Station 30 in Dallas. Harris was not a volunteer firefighter for West but responded when he heard news of the fire that broke out Wednesday night at the plant, the statement read. Harris, 52, was a father of three grown sons. "Captain Harris rushed to the scene compelled to provide assistance to his community during this crisis," said Mayor Mike Rawlings. "I want to express my deepest condolences to his family, friends and co-workers." The Texas Commission on Environmental Quality and the Environmental Protection Agency were at the scene of the plant explosion that left an unknown number of people dead, said McLennan County Chief Sheriff's Deputy Matt Cawthon in a briefing at about 3:30 p.m.
Texas Attorney General Greg Abbott also spoke at the afternoon briefing. He expressed his support for first responders and the residents whose families were "were literally torn apart in an instant." Abbott also warned businesses not to use the tragedy as a price gouging opportunity. The number of those trapped inside rubble from the explosion is still unknown, said Sgt. William Patrick Swanton in a briefing just after 8 a.m. He described the process as "slow and methodical." Some of the buildings are structurally unsound and must be reinforced before emergency crews can enter. "We're using every available resource we have to do that correct so we don't miss anything or anyone," Swanton said. "It is tedious, it is time consuming, it is a very methodical process they are doing." In addition to search and rescue teams provided by the state, squads from Fort Hood and Burleson are assisting in finding any trapped residents, the sergeant said. Swanton said he felt "pretty comfortable" estimating the amount of fatalities at between five and 15 and the number of injured at more than 160. He did not say how many residents are unaccounted for. Two women and a man injured in the blast were taken to JPS Health Network in Fort Worth. Another couple suffered shrapnel injuries despite being two miles from the blast. They're being treated at Parkland Memorial Hospital in Dallas, officials said. Swanton did confirm that there are firefighters unaccounted for. He was unsure of how many. The sergeant reported that one of the missing firefighters, who also serves as a law enforcement officer, was found in a hospital with serious injuries. The volunteer firefigthers were reported missing after responding to the fire reported at the plant before the explosion. DALLAS (KXAN) - Dallas Fire-Rescue Capt. Kenny Harris died in Wednesday's explosion in West, Texas, the city of Dallas said in a statement. Harris, 52, lived in West. He was off duty at the time of the incident, but went to the scene to see if he could help, the statement said. “Captain Harris rushed to the scene compelled to provide assistance to his community during this crisis,” Dallas mayor Mike Rawlings said. “I want to express my deepest condolences to his family, friends and co-workers." He was hailed as a role model by one of Dallas' top officials. “Captain Harris’ response is typical of all our first responders; night and day, no matter where they are, no matter if they are on or off duty they respond with the greatest acts of bravery,” said Dallas City Manager Mary K. Suhm. The DFR Chaplain and other members are currently in West, supporting the Harris family at this time. NASHVILLE, Tenn. (AP) — Willie Nelson said Thursday that he will turn an upcoming Texas concert into a benefit for victims of the explosion at a fertilizer plant not far from where he grew up. The concert is scheduled for April 28 in Austin at The Backyard. DALLAS -- The Humane Society of Central Texas will be sending 70 dogs and cats to Dallas Thursday night to free up more space to respond to animals in need and reunite owners with lost pets in the aftermath of the explosion in West, Texas. The animals transported to North Texas were already up for adoption in Central Texas. The SPCA of Texas is offering a 50 percent discount off the adoption fees for the dogs and cats on Saturday and Sunday at the Jan Rees-Jones Animal Care Center at 2400 Lone Star Drive in Dallas and the Russell H. Perry Animal Care Center at 8411 Stacy Rd. in McKinney. Those shelters are open seven days a week from noon to 6 p.m.
"The SPCA of Texas asks the community to come forward and open their homes and their hearts to these animals and the hundreds already waiting for homes in the SPCA of Texas' two North Texas-area shelters," the SPCA said in a statement. The SPCA of Texas is also standing by should the North Texas Emergency Management System should call upon them to help in the rescue of animals in West. The injured were sent to area hospitals. Call Hillcrest Baptist Medical Center at 254-202-1100; Scott and White Memorial Hospital at 888-394-4947 or Providence Health Center at 254-761-7200. Donations for victims may be made to the Salvation Army DFW Metroplex Command or the local Red Cross. A victims’ fund has been set up at Pointwest Bank. Checks can be mailed to the bank at 200 W. Oak, West, 76691 or P.O. Box 279, West, 76691. Call 254-826-5333 for more information. Brazos Valley Media Giving Back is accepting donations at Bank and Trust locations. Make the check to “BV Media Giving Back” with “West plant explosion” in the memo line. Mail to or drop off at 2900 S. Texas Ave., Bryan; 3400 Highway 21 East, Bryan; 4450 State Highway 6 South, College Station; or 2305 Texas Ave. South, College Station. Items will be accepted at this weekend’s Texas Rangers games outside Rangers Ballpark in Arlington from two hours before game time until 30 minutes after first pitch. Games times are 7:05 p.m. Friday and Saturday and 2:05 p.m. Sunday. Items will be delivered next week. Cash donations will be directed to relief efforts. Most requested items: diapers/wipes, new underwear, blankets, water bottles, grocery or home supply store gift cards, toiletries, sports drinks, toilet paper, hand sanitizer, non-perishable food, clothing, bedding, and dog and cat food. Texas Rangers and Carter BloodCare will hold a Blood Drive from 11 a.m. to 3 p.m. Sunday in the Hall of Fame, located on the concourse behind the Lower Home Run Porch. Quaker Steak & Lube will accept donations through Sunday at its locations in Plano (5584 Texas 121), Carrollton (4109 State Highway 121) and Waco (2805 West Loop 340). Also on Sunday, the Carrollton location will host a benefit event at 1 p.m. Plano and Carrollton locations will donate 15 percent of Sunday’s food sales to relief efforts. Two Frisco volunteers will deliver supplies to West. Drop off donations by noon Friday at LazyPaw Animal Hospital, 7380 Stonebrook Parkway, Frisco. Most needed are cash, tarps, school supplies, clothing, blankets, cots, bedding, bottled water, non-perishable food, baby care supplies, and pet care supplies and carriers. The Extraco Events Center in Waco is accepting donations. Call 254-776-1660 for details. Find an American Red Cross location to donate blood or schedule an appointment to donate at Carter Blood Care. In Waco, the Scott & White Blood and Donation Center is taking blood donations. WEST, Texas (KXAN) - School officials in West, Texas are working on a game plan to return kids to a "normal routine" by Monday. Three of the four campuses in the West Independent School District were in the blast zone after a fertilizer plant exploded Wednesday night. The elementary school located about a mile and a half from the site is the only campus that is not damaged. The Intermediate campus located across the street was destroyed. Aerial video from the Dallas NBC affiliate showed most of the roof caved in. West ISD is a small district of about 1,400 students and 200 employees. An emergency school board meeting was held this afternoon on the elementary campus to form a game plan to get kids back in class by Monday. During a press conference Thursday night, Superintendent Marty Crawford said they want to return kids to a normal routine as quickly as possible. Surrounding school districts in the Waco area are coming to the rescue. Connally ISD in North Waco is offering up one of their empty schools for West ISD. Grand Prairie ISD near Dallas is donating three portable buildings as well. Friday, other surrounding school districts are expected to start moving furniture and office supplies into the building to get it ready for class as early as Monday. Some districts are also donating extra school buses. School officials will be working on a new transportation plan to get students from West to the new location in Waco. The performer whose song became an anthem following the Sept. 11 attacks will do a benefit concert in the aftermath of a deadly fertilizer plant explosion. Five for Fighting will perform Thursday night at the Ferrell Center on the Baylor University campus, about 20 miles from the accident site in the small town of West. Singer-songwriter John Ondrasik performed the hit song "Superman (It's Not Easy)" at The Concert for New York City in late 2001. Five For Fighting's concert was originally part of the school's Diadeloso celebration, an annual student holiday with outdoor events. Baylor delayed the start of those activities Thursday for a time of prayer after the explosion. The concert is free and now open to everyone. Cash donations will be accepted to support relief efforts. WEST, Texas -- Authorities recovered 12 bodies from the area of the West fertilizer plant, said Jason Reyes, a spokesman with the Department of Public Safety, Friday morning. Reyes said the bodies were taken to a forensic lab in Dallas to be identified. "We are still in search and rescue mode," he said. As of Friday morning, there were about 200 people confirmed injured from the Wednesday blast. Authorities did not reveal the number of people who remained missing. Search and rescue crews have searched and cleared 150 buildings and Reyes confirmed 50 homes were destroyed in the explosion and its aftermath. Friday, authorities planned to search and clear 25 remaining homes in the area. A press conference with Sen. Ted Cruz and Sen. John Cornyn was scheduled for noon in West. Page created in 7.014 seconds with 20 queries.